Heat Shrink Wrap, Shrink Machines, and Support! Shrink wrap is used for a variety of applications from winterizing boats and large structures to packaging small retail products. It is available in rolls, bags, and tubing. Before looking at what type of shrink wrap to use. Understanding basic info about shrink wrap is important for making the right purchase. See the shrink wrapping guide below for product comparisons, details, videos, and more! What is heat shrink wrap? Often confused with stretch film, heat shrink wrap consists of a wide variety of plastic materials designed to shrink after heat is applied. Common plastics used to produce heat shrink wrap are polyolefin, PVC, polyethylene, and polypropylene. Heat shrink wrap is used as a packaging solution all around the world. Everything from wrapping frozen pizzas to bundling hardware. The proper shrink film, material thicknesses, and machines can help make production more efficient and streamlined. *Heat Shrink Wrap- a generic term that can refer to a variety of products serving multiple industries. Anything from centerfold shrink wrap, shrink tubing, shrink bags, or even marine shrink wrap rolls can be considered heat shrink wrap. Our stretch film products are often called shrink wrap by our customers. While both products are polymers that serve important roles in the packaging industry, they are completely different products with different uses and applications. Stretch film, commonly referred to as "shrink wrap" is a stretchable plastic used to secure and unitize loads. It can also be used to bundle multiple products together. Stretch film is almost always used for secondary packaging during transportation or storage. Heat shrink wrap products can be used for both secondary and primary packaging. We do offer heat shrink pallet bags to secure and unitize product loads. All heat shrink wrap requires a heating source to heat the film. A heating source, typically in the form of a heat gun or shrink tunnel is different than a sealer. The heating source applies heat to the film to shrink the film tightly around the product being wrapped. A shrink wrap sealer is used to seal the open ends of the shrink film once the product has been inserted. How Clear is Shrink Wrap? Clarity is often a concern when using shrink wrap. For retail display people typically desire a film with high clarity. The high clarity allows consumers to view the product clearly prior to purchase. The overall clarity of a shrink wrap film is determined by thickness and composition. The thicker the film, the more haze the film often has. Different types of shrink film have different clarity levels as well. See the film clarity descriptions and image below for a better understanding of shrink wrap clarity. Polyethylene and Polypropylene Shrink Wrap - Often thicker film with moderate to high film haze. Both are often available in 2-10 mil thicknesses. Thicker film in excess of 4 mils is often opaque with no clarity. PVC Shrink Wrap - Excellent clarity, can be found up to 2 mils thick. Poylolefin Shrink Wrap - Excellent clarity, can be found up to 2 mils thick. Lighter thicknesses as low as 45 gauge offers the best clarity available. Color Tinted Shrink Wrap - The tint slightly diminishes the clarity, but still offers plenty of transparency to see products within the film. *Centerfold Heat Shrink Wrap- a great option for large and small output operations. The centerfold shrink rolls come folded in half lengthways. If you were to order a 10" centerfold shrink roll, it would be 20 inches wide when unfolded. The folded shrink roll allows for quick and efficient packaging using fully automatic machines or manually operated shrink machines. The fold crease enables users to quickly and easily place products into the crease and use an L-Bar sealer to seal and cut the shrink film in one motion. This makes for a quick and efficient shrink wrapping process. Refer to the illustration on the right or view the video below to see how the product slips into the centerfold wrap. When deciding on centerfold shrink wrap, there are two primary options to choose from: Polyolefin and PVC shrink wrap. *Centerfold PVC Heat Shrink Film- A great option for multiple products across multiple industries. PVC shrink film stands for Polyvinyl Chloride. PVC is one of the most used polymers in the world. Centerfold PVC shrink works great with high-speed machines as well as manually operated machines. Our PVC shrink wrap comes in a variety of widths and lengths. It is a great option for cost-effective packaging. It ranges in cost from approximately 2.9 cents per foot to 8 cents per foot depending on the width of film you choose. Here is a great article for PVC shrink wrap cost per foot. This cost advantage, simplicity of use, and versatility makes PVC shrink film a great option for packaging a variety of products. We do recommend proper ventilation when sealing and applying heat to any PVC heat shrink product. The Chloride in the polymer emits a strong odor that can be harmful when continually inhaled in a confined area. PVC heat shrink wrap cannot come into direct contact with food products. Any heat shrink material that will come into direct contact with consumable products should be a polyolefin shrink film. *Centerfold Polyolefin Heat Shrink Film- has become a chosen shrink film in many industries. Polyolefin offers many advantages over PVC shrink but costs more per foot. A comparable 75 gauge polyolefin shrink film ranges from approximately. 3.1 cents per foot to 9 cents per foot depending on the width of film you choose. Polyolefin shrink film can come into direct contact with consumable products as well as offers better clarity and less residue on sealing wires. Due to the absence of Chloride, polyolefin shrink film does not emit the same odor PVC shrink film does. Newer lower temperature polyolefin shrink film allows users to wrap heat sensitive products with less heat exposure. Low temperature shrink wrap begins to shrink at 250 - 270 degrees Fahrenheit. It is FDA approved for direct food contact. A perfect option for shrink wrapping chocolates, fudge, and other heat sensitive products. *Shrink Wrap Bags- we offer flat, domed, and pallet shrink bags. The flat shrink bags are commonly used for books, magazines, CD's, DVD's, and more. They are an efficient means of packaging, because of the required low shrink rate and low seal temp., as well as the ability to only seal one side of the bag. Our polyolefin shrink bags are FDA approved and food safe for a variety of consumable and non-consumable packaging applications. Candy makers, bakeries, and gift shops all use polyolefin shrink bags to package and protect products. The domed shrink bags come in larger sizes and are commonly used by florist and craft companies for wrapping gift and flower baskets. 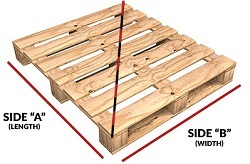 Pallet shrink bags protect pallet loads from exposure to a variety of external conditions. All pallet shrink bags are made from polyethylene shrink wrap. Large industrial heat guns are commonly used to apply heat for shrinking. *Shrink Tubing- is a great option for packaging a variety of products the same circumference, but different in length. A common product that uses heat shrink tubing is candles. We have several clients that are candle makers, who make candles of the same diameter, but different lengths. We also sell several shrink tubing rolls to companies who wrap electrical wires. The heat shrink tubing is great for bundling multiple electrical wires together. Recycling shrink wrap when possible is important for any warehouse to consider. Recycling can help produce a new film that can be used over and over. Click on the link for a complete list of plastic film recycling drop off points. Be sure to call any location you find on the list and ask if they recycle the specific shrink film you are using. We strive to offer great prices with a large variety of shrink wrap supplies and machines everything can be found from our homepage. If you have any questions, click on the live chat button, visit our contact us page, or call our toll free number at 1-800-441-5090. The use and application of shrink wrap film can vary depending on the type of material used. Although different materials can require different forms of application, the basic requirements remain the same. The product being wrapped needs to be inserted into the shrink film, open ends to be sealed, and heat to be applied to the film. In some instances opens ends do not require being sealed. View some of the videos below to see how to use shrink wrap or click on the how to use shrink wrap header for a more detailed description. Angel Hair- Thin strands of shrink film on the edges next to the seal that can be caused by a variety of issues. Biaxially Oriented Shrink Film- The shrinking of film in two directions to produce molecule alignment enhancing physical properties. Ballooning- Trapped air in a shrink wrapped package causing the film to expand outward. Burn Holes- Small holes often close to seal seams due to excessive heat applied to the shrink film. Centerfold Shrink Film- Film that has been folded in half lengthways to make wrapping easier and quicker. Core- The inner cardboard core of a roll of shrink film. Industry standard core size is three inches. Cross Linked- The cross-linking of polymers reduces the level of crystallization and results in a lowered hardness, better clarity, and higher yield strength. Crow's Feet- Wrinkles diverging out from a finished package's corners. Dog Ears- Triangular projections of unshrunk film at the corners of finished packages. Common in packages wrapped with PVC shrink wrap. Fish Eyes- Round or oval-shaped patterns on a shrink film due to inadequate heat. Increased heat will decrease fish eyes and smooth out the film. Gauge- A measurement used to describe film thickness. One gauge is equal to .254 Microns. View our gauge conversion chart for further clarification. Haze- Directly relates to a shrink film's clarity. Often described as a cloudy look to the film. Memory- The ability of a shrink film to maintain characteristics after sealing. Optics- The visual properties of a shrink or stretch film. Polyethylene- The most common plastic in the world. Found in multiple forms and products around the world. Polyethylene can be used for pipelines and trash cans as well as flexible plastic products like shrink film and trash bags. Polyethylene shrink film is often a thick film for heavy or sharp objects. Polyolefin- is a polymer produced from a simple olefin (also called an alkene with the general formula CnH2n) as a monomer. Shrink film made from this is commonly referred to as POF shrink film. PVC- Polyvinyl Chloride, a thermoplastic polymer that is the third most produced plastic in the world. PVC shrink film is a common shrink wrap used for various applications. Seal Seam- The mended line of a shrink wrapped package where two ends are attached together. Shrink Bags- A shrinkable bag with three enclosed sides. A shrink bag enables users to easily slide a product into the bags and seal the one open end. Shrink Tubing- A continuous tube placed on a roll with two enclosed sides. Shrink tubing allows users to wrap and seal longer products. Shrink Rate- The amount of shrinkage a film can obtain often measured in percentage. Single Wound- Flexible film rolled flat onto a core. Single wound shrink film is commonly used with bundling machines for packaging cases of products. Tear Resistance- The ability of a film to resist tear. Using a shrink film with a higher tear resistance is important when wrapping heavy products or products with sharp edges. Vent Holes- Tiny holes placed in shrink film allowing air to escape from sealed packages to prevent ballooning.